What's next for Casey Neistat? What’s next for Casey Neistat? As I write this, I feel safe to say that I am in good company in my love for Casey Neistat. With an ever-growing list of YouTube subscribers (648,017 as of this writing), successful projects galore for the likes of Mercedes-Benz and Nike, and a vault of brilliant video and animation experiments—Casey is becoming a modern icon and inspiration to digital creators everywhere. While we could attribute Casey’s success to all the hard work and time he has put in, one can’t help but wonder if there was some deal of diabolical significance made during magic hour at a famous crossroads in Clarksdale, Mississippi. One of his most recent pieces that I have gone all fanboy-in-love for is called “Life Explained in 27 Seconds” where Casey visually illustrates the direct relationship of our efforts and results in life. It answers the questions: what happens when we keep pace, stand still, or need to catch up? Casey recently announced that he has set aside his commercial work and, at the age of 34 with a fresh marriage and baby, will be starting up a new and innovative business venture (see the video below starting at 3:37). He is currently working through patent registration processes and can’t publicly speak a word about his new venture until his application clears. So, while full details are pending, all of us get to feel like kids the night before Christmas as we wait in anticipation for more information. To learn more about Casey, subscribe to his YouTube channel, get updates via Snapchat, follow Casey on Twitter, or visit his official website at casey.nyc. // Feature photo courtesy Hans Gerhard Meier / Flickr, some rights reserved. 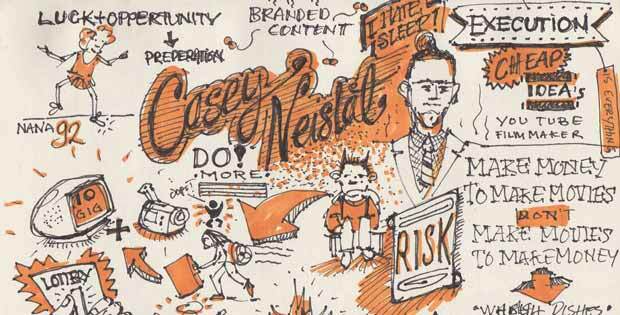 Do you think I could have a high resolution copy or picture of the sketch note you did on Casey Neistat. I loved the way it looked and wanted to use it as a desktop back round, but found the quality was not great enough. If you could do that it would be greatly appreciated. The beautiful sketch note on this post was created by Hans Gerhard Meier during Casey Neistat’s keynote at South by Southwest in 2014. You may access a high resolution version of the sketch by visiting Hans’s Flickr page here.